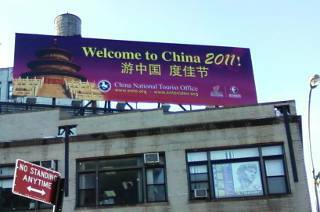 Welcome to China - ominous or ironic Manhattan sign for those who fear the Sino economic uprising? China must have been the biggest celebrant of Christmas 2010. That is, if the goods on sale in New York city can be used as the measure for holiday gift giving and consumption in the USA. In almost every major Manhattan store, the story is the same on the labels, from shoes and socks to designer coats; from analog watches to the latest digital electronic gadgetry: Made in China/Fabriqué au Chine. When other activity in global industry, trade and commerce are factored, if this were the opening salvos of a soccer match the Chinese seem to have more possession of the play than the opposition. From the rainforests of Suriname to tourist resorts of Jamaica, the Tanzanian Serengeti to the oil fields of Sudan, China is now the fount of development funding and aid. 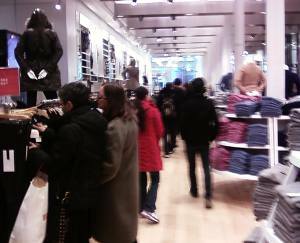 Inside the UNIQLO - the casual apparel brand from Japan - Soho, NY store, almost every item is made in China. For people like the late Jamaica prime minister, Michael Manley, Tanzania’s Julius Nyerere and their successors, we may be witnessing a non-aligned nirvana with “South South” trade between China and African countries, between India and Brazil. Some Western conservatives who pinned their future on open markets in the left wing state-controlled world, now see their worst nightmare as the communists with capital advancing what appears a no-strings-attached investment strategy in the developing countries. For poor underdeveloped societies it is debatable whether it’s “no-strings-attached” attached or business as usual. Richard Price’s just released Rainforest Warriors – Human Rights on Trial (University of Pennsylvania Press) is not principally about the Chinese presence and role in the genocide on the Saramaka people of Suriname. It is about the government in Paramaribo’s complicity and conspiracy in facilitating the destruction of the environment and way of life of local people in the name of development and modernization. Since the mid 1990s the Saramakas – descendants of the marooned Africans who won freedom and lands in the 1700s from Dutch Guyana’s colonizers – have been waging a relentless legal battle in the Inter-American Commission on Human Rights and the Inter-American Court on Human Rights in a near futile effort to stem the wanton large scale clearance of their traditional home and farm lands by Chinese loggers who were awarded concessions by the Suriname government, without consultating the people. In Jamaica, where Prime Minister Bruce Golding is battling for his political life and to turn around a moribund economy carrying double digit unemployment, Chinese aid in developing housing is eagerly welcomed. Golding controversially irked his critics by defending the Chinese government offer that ties in Chinese labour to complete the project, when he alluded to China’s need to provide jobs for its huge population. China’s story in Tanzania concerns what activists say threatens the fabled Serengeti and Africa’s migrating wildebeests. According to Forbes magazine, conservationists, both inside and outside the country, believe the project will be disastrous, affecting the million wildebeests and zebras that migrate annually in one of the planet’s most extraordinary spectacles. “The World Bank, taking into account such concerns, rejected a funding proposal for a similar highway in the 1980s, thereby killing the ill-conceived plan,” Forbes reported. We may well question why there is such a dilemma in a country with gold, natural gas, diamonds, coal, iron, ore, uranium, nickel, chrome, tin, platinum and other minerals but whose population lives without amenities common in Western cultures. And culture is the key idea here. What exactly is it that those who fear the rise of China abhor? Certainly it is not concern for pristine environments nor concerving wild or human life. The development of the Western hemisphere by Western European powers shows that there was no care whether the buffalo had land to roam or the Aztec a place to build pyramids. Those live now only in historical documents. As recalled by Price in Rainforest Warriors, the Saramaka people only have to recount the massive flooding of their land by the Dutch government, that wiped out many villages in the 1960s, to build a dam for supplying electricity to Alcoa’s bauxite mining activity in Suriname. The Empire strikes back? 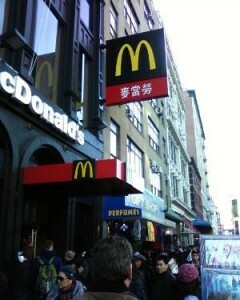 McDonald's in Chinatown, Manhattan. For developing countries it may merely be a matter of what Jamaicans call swapping “black dog fi monkey” (one evil for another). In the developing world the fear is loss of a Roman dominance of culture for the past 2000 years. It’s a fear of the unknown. Those of us who are English speakers, can spell French, Spanish or even some Russian words on a page or a sign even if the message eludes us, giving us a certain comfort. When we look at Chinese and other Asian language characters, we are as lost as illiterates in our own linguistic culture. Whether the fear is legitimate is to be seen. The Chinese gave the Western world gun powder and rockets and we are intrigued by Confucius but the collectivism that predates Mao and Marx, so far seem permeable in the face of the goods of the West, such as jeans, the personal computer and associated technologies imbued with individualism, which the Chinese are throwing back at us, complete with broken English manuals that read like obscure poetry. At any rate, when we sat down to lunch at a restaurant in Chinatown, Manhattan, we did come across the strange case of the soy sauce on our table Made in the USA. Well written and researched story. It used to be that the Third World looked to entities like the World Bank, IDB, EU when they needed big capital to drive certain infrastructure development, now its China singlehandedly. The federal govt. of the USA now depends heavily on China to purchase its treasury bills to finance its budget. It’s the changing of the guards, the falling of an empire that we are seeing in our lifetime, not unlike Great Britain ceded power to the US, and a series of other great powers before them. It’s sad that we do not see like mother Africa is shaping up anytime soon, but perhaps she has seen her best days already, ie in the time of the Pharaohs and pyramids. Everybody gets their turn I guess?